Swedish ship-owner, Michael Krafft, has realized his lifelong dream to provide unique sailing experiences which are often away from ports congested with tourists. Before Kraftt’s elegant 170-passenger identical Star Clipper and Star Flyer were commissioned in 1991, he meticulously researched the Golden Age of tall, swift sailing ships in order to reflect their nostalgia and romance. He also wanted to provide the luxury of a modern mega-yacht at affordable prices. 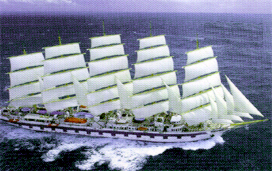 The success of the twin Clipper Sisters in the 90’s convinced Krafft that in 2000 the time had come to launch the 227-passenger Royal Clipper, now the largest true sailing clipper ship in the world. Although passengers are not required to assist the crew in sailing the three Clipper ships, they have opportunities to help with the lines or take the helm. Some even opt to climb the mast to the crow’s nest for a panoramic view of the horizon. At sea, Royal Clipper is always under sail power except when weather or sea conditions require she be assisted by her twin 2,500 horsepower diesel engines. The rich décor of the Clipper ships is reminiscent of its proud heritage. Polished brass and gleaming mahogany, an Edwardian-style library with Belle Epoque fireplace (plus two computers). The convivial indoor-outdoor Tropical Bar and Piano Bar all boast antique prints and paintings of famous sailing ships. But the most dazzling of the interior spaces is the majestic dining room. An open atrium begins at the Piano Lounge on the Main Deck with a spiral staircase that ends at the center of the Dining Room three decks below. Soft piano music filters through the dining room during the open-seated evening meal which features excellent international cuisine and a no-tie dress code. All cabins are furnished in Royal Blue and dark wood panels. Standard cabins are 175-square feet with adequate storage and a compact, but well-designed bathroom. The fourteen deluxe deck suites which measure 225-square feet have balconies and a wide view of the ocean. These are very much in demand and should be booked early. The TV/DVD players in each cabin need to be up-graded, as does the ship’s library of DVD’s. Although room service is not available, it’s only a short walk from any cabin to get a sunrise cup of coffee at the bar. Better yet, a ship’s officer always welcomes a friendly chat on deck. Typically, about half the passengers are from the U.S. and most of the others are from France and Germany. The Cruise Director makes announcements in all three languages and the currency on board is the Euro. Most of the low-key social activities take place on deck next to the Tropical Bar (where smoking is permitted). They include talent shows, crab racing, star-gazing and amateur entertainment by local performers. According to many guests (myself included! 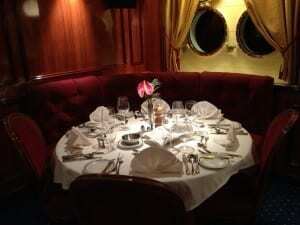 ), it’s this easy-going informality that contributes to making the cruise so enjoyable. The ship, however, is not appropriate for persons with mobility issues, as there are lots of stairs (no elevator) and getting from the ship to the tender can be challenging. There are three very small swimming are pools aboard and the Captain Nemo Spa and Health Club. In port, a convenient marina platform lowers from the stem for watersports. Snorkeling, kayaking, sunfish sailing, wind surfing, and water skiing are complimentary. Scuba diving is available for a fee and certification is required. Some of divers reported that the diving and snorkeling opportunities were much better on previous cruises. When we sailed away from each port , the sails were raised with great ceremony as the moving “Conquest of Paradise” by Vangelis played on the loudspeakers. 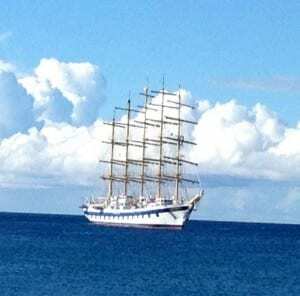 To get a feel for the majesty of the three Clipper ships under sail, I recommend you watch the 10-minute video “Tall Ship Cruises that Dreams are Made of,” at www.starclippers.com. Select the “Explore” tab at the top of the screen. Royal Clipper sails one-week itineraries in the Western Mediterranean, the Star Clipper in the Eastern Mediterranean, and the Star Flyer in Northern Europe, France, Spain, Portugal, and Morocco. All three ships also offer Grand Voyages of 12-18 days from April to October. 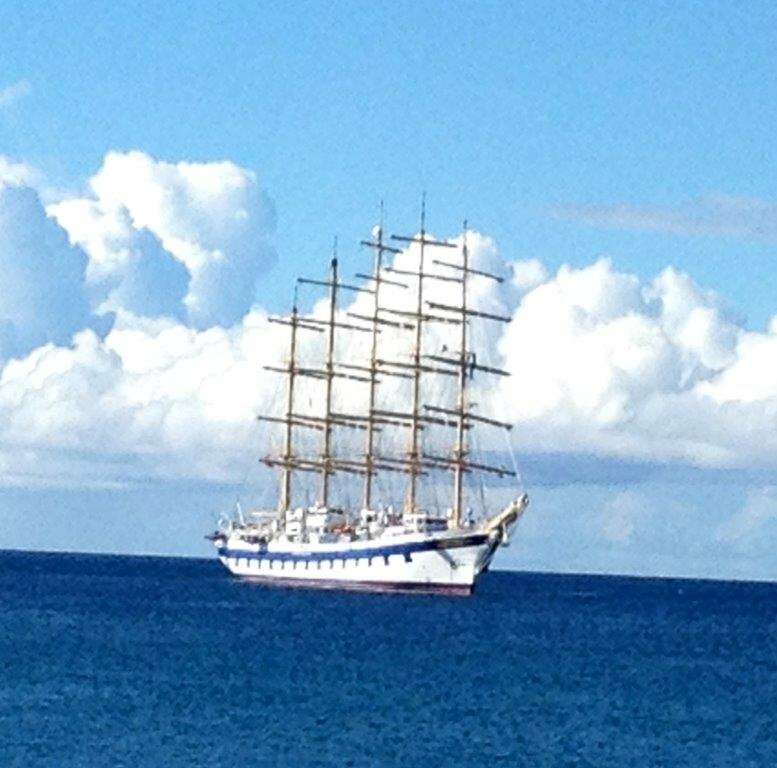 Royal Clipper offers weekly round-trip voyages from Barbados to the Grenadines and the Star Clipper, round-trips from St. Maarten. The Star Flyer sails through the Panama Canal to Costa Rica, Nicaragua, and Panama.